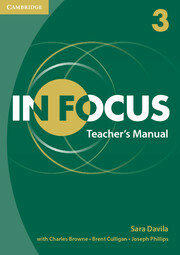 In Focus is a corpus-informed, three-level (pre-intermediate through high intermediate) EFL course aimed at university and college students. It is designed to build vocabulary, reading, discussion, presentation, and critical thinking skills. It is supplemented by a comprehensive range of dedicated digital components, which offer great fl exibility and help to speed language acquisition. Each Student’s Book contains 12 topic-based units. Topics include Population, Environment, Sports, News, Fashion, Technology, Climate Change, and Gender Equality.